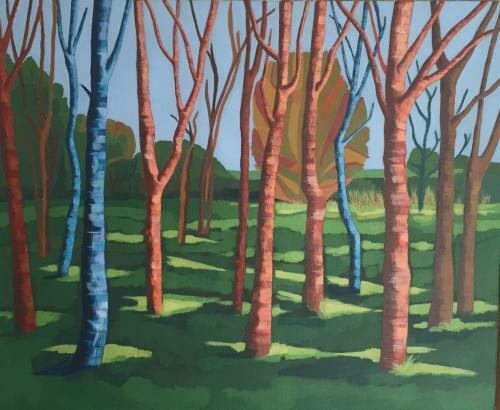 Bushton Trees Summer - oil on linen 51 x 41cms - £650. My work is inspired by the landscape that surrounds me. It’s beauty and generosity surprises and delights me every day. I am compelled to respond by striving to capture that essence; that colour; the unfolding seasonal drama that never ceases to take my breath away. Much of my work is taken from the experience of walking; observing clumps of trees or wider horizons on the Ridgeway and in other landscapes I encounter. A Londoner at heart, I try to bring a different perspective and vision through my paintings – perhaps that element of surprise and wonder that comes from being delighted, impressed and thrilled by the natural world around me. Above all it is the colour and shape of the landscape that I am responding to. I work principally in oil. I start by making quick pencil sketches in situ, sometimes taking photographs; then work on more detailed charcoal sketches back in the Studio. From there I map out my colour palette often using layer upon layer of highly saturated colour. Paintings will take many sessions before I am happy with the final finish and atmosphere. Most of my work is painted onto high quality linen whose surface I favour for its organic grain and texture which fits well with the landscape subject.